Koyo (rhymes with yo-yo) is a fairy who is unable to use magic, and like many other magic-less fairies, she's turned to science. She feels a bit low about herself regarding this path, until magical beasts, who have mainly kept a distance from the peaceful fairy county, start encroaching and traditional magic hasn't been able to keep them at bay. So Koyo takes it upon herself to see if she can study and understand the mythical monsters enough to find a solution without relying on magic. As for gameplay, I'd hesitate to say it uses turn based combat, as you're not equipped to fight dragons and unicorns, but the idea of the main mechanics (that I'm admittedly still trying to work out) is that the animal you're studying makes some sort of move, then you, playing as Koyo, have a number of options to learn more about it, and so on until you've gathered enough information. Things can/will get sticky if it notices you, though! The intentions for the art- characters, monsters, backgrounds, GUI- are going to be rather cute, simple, and 'round', and I'll be using photoshop to create them. The engine I'll be using is Love2D, which is entirely new to me. I'm definietly interested to see what fun monsters and flavortext surrounding them you come up with! The idea of a turn-based safari/field study sounds really cool! This sounds really original! It'll be interesting to see how this turns out! Wow, thank you everyone for your kind feedback! I'm so sorry for taking so long to update. Part of it is because I've been quite busy these past few days and haven't gotten an awful lot done, and am a bit embarrassed to make an update for something kind of small. But I really appreciate everyone's encouragement, and I hope to create a game worthwhile of your support, and I hope you'll continue giving me feedback so that I can. So I've primarily been making a physical prototype to get a feel for how this will look and play out. The rough illustration is a representation of what the screen will look like in the 'final' product. 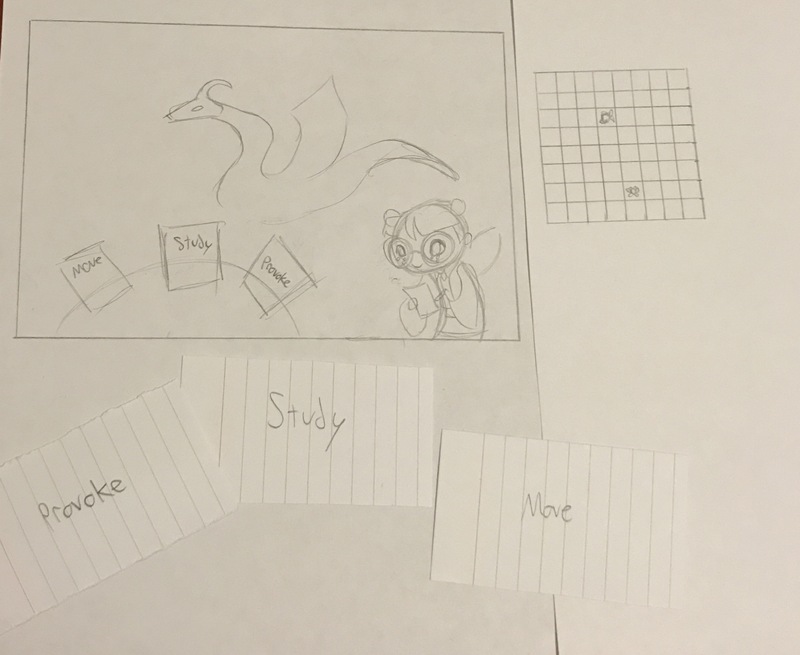 I made a card for each of Koyo's possible actions, and if I were to play the prototype, I'd flip the card over on the screen -there are multiple options for each, to indicate it'd be a pop up screen with options to choose from. The grid, which won't be visible to the player (subject to change) shows the position of the beast and Koyo in the field. Study: Behavior or Physiology - Koyo can either watch how it behaves or take notes on the physiology, when she's close enough to get enough information to take notes on. This is how she will gain different pieces of crucial information on each animal she comes across. So here's the rough outline on how the turn-based field study (hope you don't mind me brazenly stealing that term, Krall, because it's perfect!) would be like.